Aroostook County – When the world’s top biathletes converge on northern Maine this coming February for the 2016 International Biathlon Union World Cup, some of their top supporters in the stands at Presque Isle’s Nordic Heritage Center will be schoolchildren from throughout the region. Aside from experiencing the thrill of Europe’s number one winter sport, the coming Biathlon World Cup will bring with it many lessons for County youth, both inside and outside the classroom, that include geography, world cultures, language, and even math and science. The official kickoff to those learning opportunities was celebrated today in the fifth grade classroom of Teacher Robin Norsworthy at Presque Isle’s Zippel Elementary School. Joining the students and Norsworthy were organizers of the coming event and officials with Katahdin Trust Company, which is supporting the World Cup as partner for the school program. In the coming weeks, curriculum guides, to assist area educators in developing activities to better engage students with the Biathlon World Cup, will be distributed electronically to schools across Aroostook and beyond. The booklet contains information on how to bring into the classroom valuable lessons in advance of, and during, the competition set for February 11 through 14, 2016. Leading the effort to engage area youth on behalf of the event organizing committee is Elaine Hendrickson, who chairs the school program initiative. The well-known, retired teacher knows firsthand how international biathlon events can positively impact the learning of schoolchildren. Teacher Robin Norsworthy could not agree more. She is already planning how her fifth grade students at Zippel Elementary School will get the most out of the world coming to their doorstep. She spoke at the press event about how she has engaged her students in the past when similar activity has come to the region, and her plans for the coming months as her current pupils looked on. Those efforts will be supported in by Katahdin Trust Company, which is partnering with the 2016 International Biathlon World Cup Organizing Committee to present the school program. President and CEO Jon Prescott joined in the classroom announcement, sharing with the students and others gathered why it is important for Katahdin Trust to be on board in this way. “All of us at Katahdin Trust are proud to be a part of this event in such a unique way to help educate the next generation of biathlon athletes and fans. Our participation is an extension of our commitment to the communities that we serve, broadening the horizons of hundreds of students by bringing the IBU Biathlon Word Cup into Maine classrooms,” said Prescott. Prescott and some of his Katahdin Trust Company colleagues joined with Towle, Hendrickson, Norsworthy and her students in unveiling the cover page of the electronic curriculum guide. To demonstrate both the use of technology and other instructional tools that will be incorporated into the Biathlon learning experiences, students simultaneously revealed the cover design with a traditional unveiling, as well as one using the classroom smart board. IBU World Cup 8 will be hosted by the Nordic Heritage Sport Club at their world-class Nordic ski and biathlon venue as the next to last in a series of nine stops on the 2015-2016 international circuit, and the only stop in the United States. Teams and visitors from the participating countries are expected to arrive in Aroostook County three days prior to the start of competition and depart the region on February 15. Upwards of 300 of the world’s top male and female biathletes, age 20 and over, from more than 32 countries are expected to be in Aroostook County for the competition. The biathletes will participate in six competitions: sprint, pursuit, and relay in both men’s and women’s divisions. The 2016 event will mark the first large-scale event hosted in The County since the Nordic Heritage Center has operated independently of direct support provided by the Maine Winter Sports Center. The operation and maintenance of the world-class four-season sports facility, located just off the Fort Fairfield Road in Presque Isle, are supported in large-part by the Libra Foundation, as well as local businesses and organizations, other donations, club memberships and revenue generated by events, including those sanctioned by the International Biathlon Union. 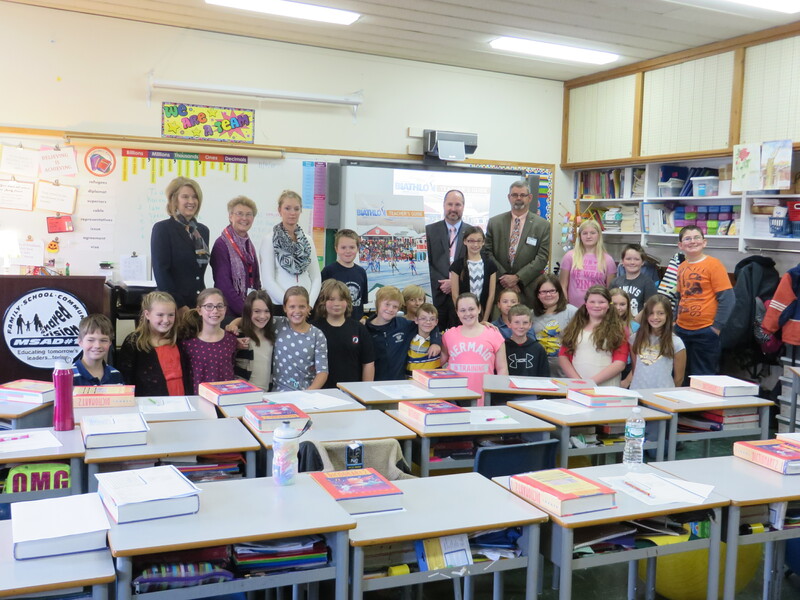 Organizers of the 2016 International Biathlon Union World Cup coming to Aroostook County next February and Katahdin Trust Company Leaders gathered in the fifth grade classroom of Robin Norsworthy at Zippel Elementary School in Presque Isle to officially launch the School Program component in advance of the coming international event. Taking part in the ceremony, which included the unveiling of the cover of the school curriculum guide were (standing, left to right) Jane Towle, World Cup Event Director; Elaine Hendrickson, World Cup School Program Coordinator; Robin Norsworthy, Fifth Grade Teacher at Zippel Elementary School; Clayton Burse, Fifth Grade Student; Jon Prescott, President and CEO of Katahdin Trust Company; Ali Rowbotham, Fifth Grade Student; David Cambridge, Regional Vice President & Commercial Services Officer for Katahdin Trust Company; and Fifth Grade Students: Bailey Emerson; Thomas Whitmore; and Chauncey O’Connell. Also taking part in the ceremony were Zippel Elementary School Fifth Graders (kneeling, left to right) Garrett Fullen, Erinn Kelly, Olivia Kohlbacher, Keira Cyr, Abagail Johnston, Cody Chasse, Dawson Kinney, Brady Roy, Sean Smith, Kayleigh Perry, Ali Goodblood, Landon MacDougal, Tristin Farris, Megan Robinson, Hailey Rouse, and Isabella Keegan.